How Do I Search a Site That Has No Search Box? - Ask Leo! Many sites have no search facility. Fortunately it's easy to do it yourself using a search engine like Google. Even when sites provide their own, your do-it-yourself solution may even give you better results. It’s a handy trick to know. In addition to just searching for whatever words you throw into Google’s search box, there are a number of special instructions you can include. They’re called “search operators”. Google has a handy list. You probably know some already. Things like the quote operator, using “OR”, or perhaps the “cache:” operator and the like. The one we care about here, however, is the “site:” operator. “site:” causes Google to restrict its search results to pages from the site you specify. 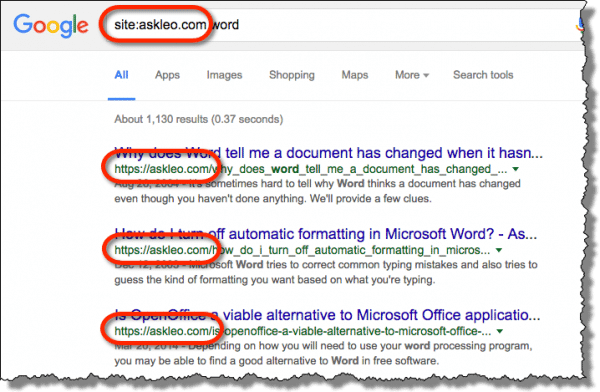 For example, searching for “site:askleo.com word” will return results only from askleo.com1. In other words, it’s a way to search a specific site, whether or not that site has a search function of its own. In the case of Ask Leo!, my search function is implemented using Google search, so the results from using “site:” versus using the search box at the top of the page should be relatively similar. What I’ve found, however, is that even when a site has a search function of its own, using Google often gets me better results, or at least presents a different view on those results. The one exception to all this is if a site has told Google it does not want to be included in Google search results at all. In those cases, the “site:” operator on Google search won’t help. You can try other search engines, like Bing, which also have the “site:” operator, but typically, if a site has specifically told Google to ignore it, it’ll have told all the major search engines the same thing. “Site:” is actually a pretty interesting tool to find out if a site has been indexed by Google at all. Just search for nothing, using the site: operator. If there are results, then the site is in the Google index. If there’s nothing, it’s not. This can happen for new sites that are waiting for Google to discover them and get indexed. By the way, the results count shouldn’t be taken as accurate. It’s an approximation at best, and can be off by quite a bit, particularly for large sites. Does visiting a search-engine cached page prevent the original site from noting my visit? - Even a cached version of a website could send information about you back to the original server. The thing is that we just don't (and can't) know. 1: Turns out that subdomains are considered part of “the site”, so searching site:askleo.com will also return results from forum.askleo.com, glossary.askleo.com, and so on. The reverse is not true, so searching site:glossary.askleo.com will search only glossary.askleo.com. Using Google’s Advanced Search means you don’t have to remember the operators – and also enables you to search within a date range without having to enter dates in Julian format! Control F is handy for many sites with a little search box opening up on the right top. I just did it, typed in Leo and found that your name was in 20 locations on the browser page that was open. That’s a useful tool. I use it several times every day, but it does something completely different from the ‘site:’ operator. It only searches for the exact text string you typed on the current page in your browser. I use that all the time. But let’s be clear: that searches the page you’re on, not the entire site. I just tried this out for fun. I typed this in google search box. ” site:cnn.com/indiana” Nothing came up. I also tried Isis instead of indiana. Some things came up in Arabic. What’s going on? You need a space between “site:” and “CNN”. Actually not – it’s site:cnn.com and then a space followed by search terms. Google has been working fine until last few days and now when I search for something using the Google Search Box it only shows one or two sites, instead of the long list, like before. Have I hit a wrong button on my phone (Samsung Galaxy S4) or could I have done something when I was in settings on my laptop bc it’s happening on all of my devices that are synced to one another…Google Chrome is doing same thing.